The College of Law will host the 2016 Order of the Coif Distinguished Visitor, Eugene Fidell, on Thursday, March 31 at 7:15 p.m. in the Gray Ceremonial Courtroom in Dineen Hall. His talk is free and open to the entire University community. Fidell is a senior research scholar in law and the Florence Rogatz Visiting Lecturer in Law at Yale Law School. 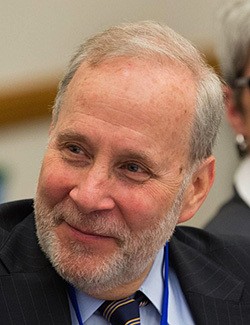 Since graduation from Harvard Law School in 1968, he has been a partner at LeBoeuf, Lamb, Leiby & MacRae and Feldesman Tucker Leifer Fidell LLP, where he is currently of counsel. He served in the U.S. Coast Guard from 1969 to 1972 as a judge advocate, and has continued to be actively involved in military legal matters, serving from 1991-2011 as president of the National Institute of Military Justice. He began teaching at Yale in 1993, and has also taught at Harvard Law School and the American University Washington College of Law. Fidell has written on labor, environmental, energy and military law, as well as judicial administration, and often serves as a commentator for domestic and foreign news media. Most recently, he has taken on a number of high-profile cases relating to military law, including Guantanamo Bay, Pvt. Chelsea Manning and Sgt. Bowe Bergdahl, among others. excellence in legal education. It offers member institutions the ability to apply to host its Distinguished Visiting Lecturer. The College of Law, a member of the Order of the Coif since 1952, is also making Fidell’s address open to over 150 attendees of the National Conference of Law Reviews, which it is hosting from March 31-April 2.